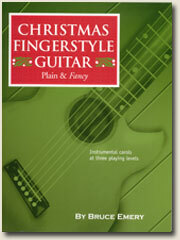 This book contains 18 traditional Christmas carols for solo guitar by Bruce Emery. Better yet, there are three different arrangements of each song to match your current reading and playing level (which will likely improve by next Christmas). The first level is for beginners while level three arrangements will challenge you. The book also contains 18 pages of Fingerstyle Guitar 101 for reference and review. Now Available: Companion CD!